View of the interior of St Marys of the ancient parish of Truro. The church in the picture was built between 1504-1518. 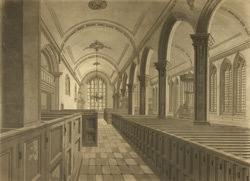 The 16th century church had a chancel, nave, north and south aisles, north gallery and vestry. In 1877 when Truro became a bishop's see, St Marys was incorporated into the new Cathedral building. Only the south aisle was retained.